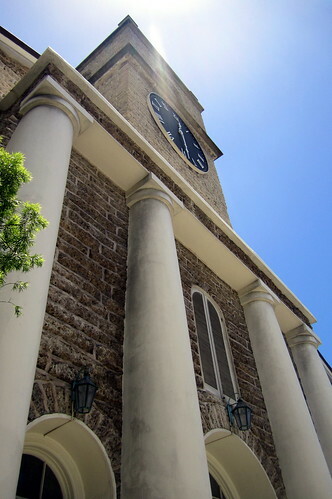 Kawaiaha’o Church, located at 957 Punchbowl Street, revered as the Protestant "mother church" of Hawai’i and often referred to as the Westminister Abbey of Hawai’i, was dedicated on July 21, 1842. 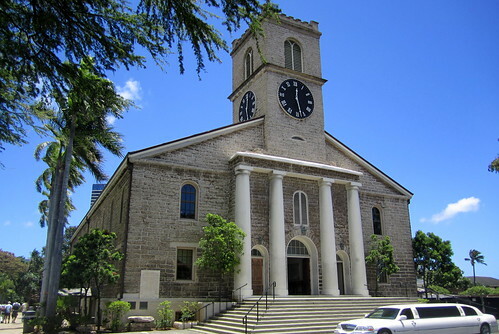 Commissioned by the regency of Ka’ahumanu during the reigns of Kamehameha II and Kamehameha III, the church was designed by Reverend Hiram Bingham in the New England style of the Hawaiian missionaries. 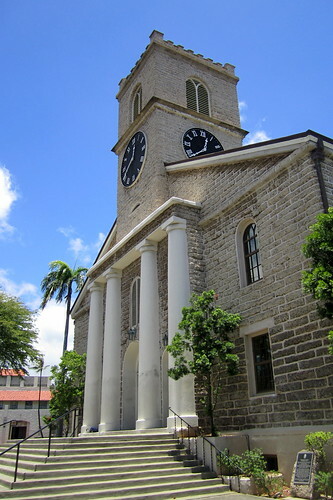 Originally functioning as a national church of the Hawaiian Kingdom and chapel of the royal family, Kawaiaha’o was the scene of inaugurations, funerals, and weddings associated with the Hawaiian Kingdom. 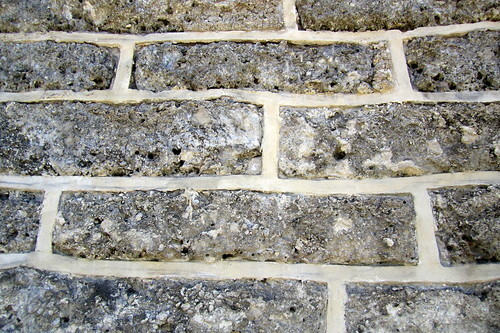 The "Stone Church," as it came to be known, was constructed on a site that housed four previous native-style sanctuaries of some 14,000 thousand-pound slabs of coral rock, quarried from an offshore reef off the southern coast of O’ahu. Natives dove 10 to 20 feet to hand-chisel these pieces from the reef, then raised them to the surface, loaded them into canoes, and ferried them to shore. The interior, which was mostly remodeled in the 1920s resulting from rot, was made from wood cut in the Koolau Mountains. The upper gallery of the church is adorned with 21 Hofstot portraits of Hawaiian royalty (Ali’i), beginning with Kamehameha the Great at the far end. A tower clock, referred to as the Kauikeaouli clock in memory of its donor, King Kamehameha III, was manufactured by Howard & Davis Clock Makers and still operates on its original machinery. The church’s name, Ka wai a Ha’o, means "fresh water pool of Ha’o" in Hawaiian. Prior to the missionaries arriving, the flat plain south of the village of Honolulu was a barren dust bowl, with the exception of a small spring whose waters were reserved exclusivley for the land’s high chiefs and chiefs, including the ancient queen, Ha’o. Behind the church sits the peaceful Mission Cemetery where the remains of many of Hawaii’s early missionaries, political and economic leaders are buried. Most prominent among them is King William Lunaililo, whose mausoleum is surrounded by a wrought iron fence near the entrance to the church grounds. Church of the Holy Trinity at West Lafayette Avenue and Wheeler Avenue facing northeast within the proposed Edmondson Avenue Historic District. 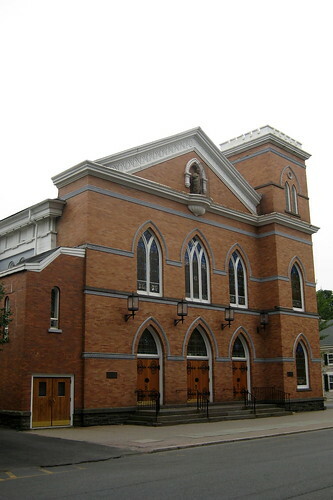 The Saint Joseph’s Roman Catholic Church dates back to 1863 when the St. Joseph’s School was founded in Wilbur by the pastor of St. Mary’s Parish in Rondout. This plot of land was bought in secrecy, due to anti-Catholic prejudice, in 1868 and the edifice was formally dedicated on July 27, 1869, although not completed until 1898 when the vestibule, bell tower and brick facade were added. 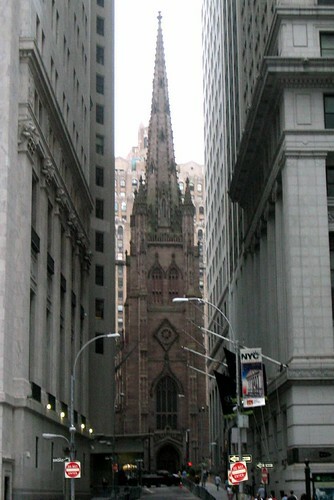 Prominently located at the terminus of Wall Street, the present day Trinity Church, designed by architect Richard Upjohn, is considered a classic example of Gothic Revival architecture. Consecrated on Ascension Day May 1, 1846, it is the oldest Episcopal church in New York City. At the time of its completion, the 281-foot spire was the highest point in New York until being surpassed in 1890 by the New York World Buiolding. The first Trinity Church, constructed in 1698, was destroyed in the Great New York City Fire of 1776 following the capture of the city by the British in the Battle of Long Island. In 1784, the Rev. Dr. Samuel Provoost, was appointed Rector of Trinity (1784-1800) and the New York State Legislature ratifies the charter of Trinity Church, removing a provision that asserted its loyalty to the King of England. In 1843, Trinity Church’s expanding parish was divided due to the burgeoning cityscape and to better serve the needs of its parishoners. The newly formed parish would build Grace Church, to the north on Broadway at 10th street, while original parish would re-build the Trinity Church that stands today. 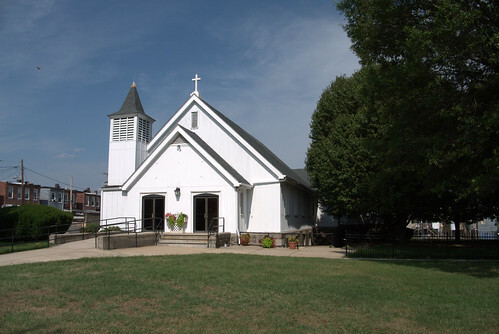 Both Grace and Trinity Churches were completed and consecrated in 1846. Upjohn designed the new Church in Neo-Gothic fashion, complete with sandstone and stained-glass windows–two features unheard of at the time. 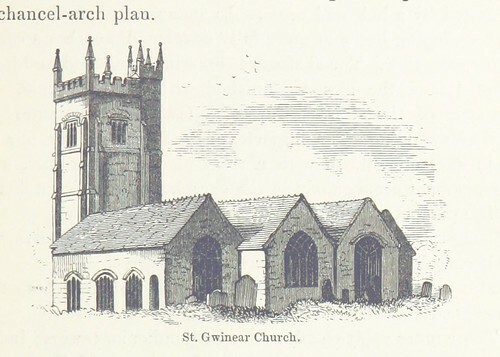 Adorned with Gothic spires and pointed arches, and sporting a very linear upward-appearing exterior, Upjohn’s design reflected "High Church" fashion, at odds with contemporary Protestant "Low Church" thought. As a compromise, the side walls were kept simple, wtihout the flying buttresses predominant in most Gothic structures. No such compromise was made with regards to the flamboyant Gothic heavy bronze front doors, however. The adjoining Trinity Churchyard Cemetery, opened in 1697, is one of three separate burial grounds that make up the non-denominational Trinity Church Cemetery (the others being the Churchyard of St. Paul’s Chapel and the Trinity Church Cemetery and Mausoleum at the Chapel of Intercession). Among the 1,186 interred here are Alexander Hamilton, William Bradford, Robert Fulton (memorial tribute), Captain James Lawrence, John Jacob Astor, Horatio Gates, and Albert Gallatin. There is also memorials to the unknown martyrs of the Revolution buried on the grounds, 16 officers of the Continental Army and Navy buried in the church cemeteries, and to the thousands of Americans who died in prison ships in New York Harbor. 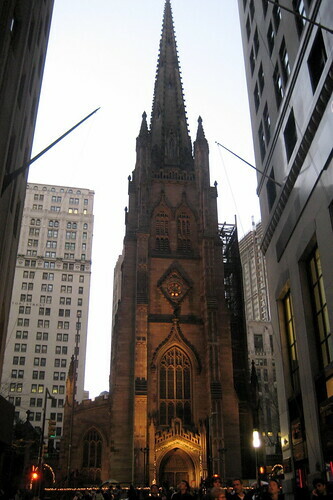 Prominently located at the terminus of Wall Street, the present day Trinity Church, designed by architect Richard Upjohn, is considered a classic example of Gothic Revival architecture. 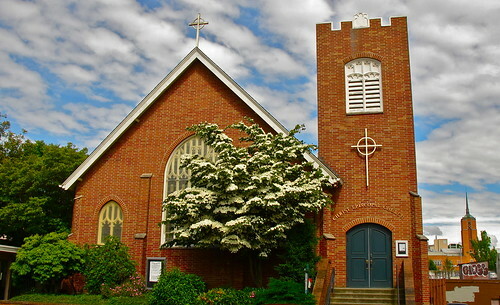 Consecrated on Ascension Day May 1, 1846, it is the oldest Episcopal church in New York City. At the time of its completion, the 281-foot spire was the highest point in New York until being surpassed in 1890 by the New York World Building.